One of the most recognizable characteristics of raptor dinosaurs — the clever, pack-hunting carnivores immortalized in the Jurassic Park movie series — is the enormous, scythe-like talon located on the second digit of each of their feet. But the true function of this intimidating anatomical feature has puzzled paleontologists for years. 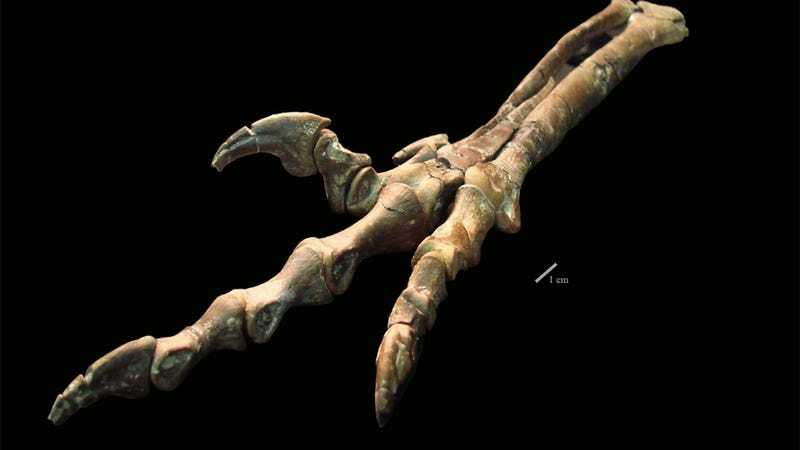 Now, by examining the fossilized remains of a recently discovered species of raptor, scientists have found new evidence that the claw was, in fact, used as a weapon. The newly discovered raptor species belongs to a rare group of feathered dinosaurs known as troodontid therapods. Historically speaking, very little research has been done on troodontids owing to a lack of fossil material; as a point of reference, the new species — named Talos sampsoni (artist's rendition below) — is the first definitive troodontid theropod to be named from the late Cretaceous of North America in over three quarters of a century. "Finding a decent specimen of this type of dinosaur in North America is like a lighting strike," said Lindsay Zanno, lead author on the paper classifying the specimen. "It's a random event of thrilling proportions." But just as exciting as the discovery of T. sampsoni itself is what its remains reveal about raptor behavior, because it just so happens that this newly discovered dinosaur died nursing an injury — an injury to one of its enormous, hook-like second digits. "When we realized we had evidence of an injury, the excitement was palpable," explained Zanno. "An injured specimen has a story to tell." In the case of T. sampsoni, the scientists claim that the injury to the raptor's toe tells a tale of action and active use. Examination of the individual bones in the raptor's fossilized foot using a high-resolution CT scanner similar to the one your doctor uses to image bones and organs in your body — pictured up top — revealed that the injury was restricted to the second toe, and had likely suffered from an infection after being either bitten, fractured, or both. People have speculated that the talon on the foot of raptor dinosaurs was used to capture prey, fight with other members of the same species, or defend the animal against attack. Our interpretation supports the idea that these animals regularly put this toe in harm's way. Our data support the idea that the talon of raptor dinosaurs...was an instrument meant for inflicting damage.